The Lenovo 720 80X600FSIN runs on Windows 10 Home Edition. The laptop features a 13 inch,Full HD WLED Backlit IPS Anti Glare Touch Wide View Display, 1920 x 1080 pixel and is powered by a Intel Corei7 7th Gen,2.7 GHz with Turbo Boost Upto 3.5 GHz processor. To enhance multi-tasking and fast speed, the company has offered a 8 GB DDR4 RAM. 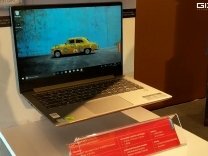 Talking about the storage, the laptop uses a 5400 (RPM) storage.There is a Bluetooth,Light Weight,Retina Display,Spill Resistant Keyboard and more.The laptop has a Upto 10 hours battery that will give enough battery life to the users.